Words can be tricky. Whether you're writing a message to a colleague, composing a business document, crafting a novel, or working on a business plan, you want to get it right. Although word processors and Web browsers have built-in spelling checkers, they don't evaluate your grammar, pinpoint clichés and bad writing, or help you structure long-form documents. I set out to find some applications that do. As we dive in, keep a couple of things in mind. First, no single tool will assist you with all of your writing needs. Some programs are great for long-form writing, for instance, while others will help you tweak your wording. Second, a good writing assistant is very different from a spelling checker. The applications described here are not automatic: Instead, they present questions for you to consider, and their advice is not always right. You still have to decide what to accept and what to reject. The most common type of writing that people do is informal, such as in chat messages, tweets, and email to friends and colleagues. If you sometimes make embarrassing mistakes when composing such missives, the free application Ginger might help. Aimed chiefly at nonnative speakers, Ginger tries to catch awkward wording and typos. Its built-in spelling checker is top-notch; in my tests, it was able to guess what I was trying to write even when I made lots of typos in one sentence. Unfortunately, its awkward-wording detection is not as impressive--it did not always offer help when I composed unnatural sentences, particularly when they contained no typos. Ginger sits in the system tray and helps with your writing in Firefox, Internet Explorer, Microsoft Word, and a handful of other supported applications. Some writing applications are "writing assistants" that provide usage advice, help you tighten up your text, show you how to avoid commonly misused words, keep you in the active voice, and more. At their finest, these utilities will act as a "pre-editor" for your real human editor, if you have one. And if you don't, they can be the next best thing--when you use them correctly. Since people often do their "serious" writing in a word processor, it makes sense for these applications to integrate tightly with Microsoft Word. For example, ClearEdits and Sentence Aerobics are both add-ins that you use right within Word. ClearEdits ($80) works a bit like a copy editor's first run through your manuscript: It rapidly goes over your document, hunting for words that it believes should be changed. It then highlights those words and adds comments to them, explaining why you might want to revise them. It doesn't delve too deeply into grammar (active/passive and so on), but its simple advice can be useful. After Sentence Aerobics ($159) has added its own pane to Word, it analyzes your documents in segments. You select a piece of your document, analyze it, tweak it according to the recommendations (or not), and then move on to the next piece. Even though the usage advice built into Sentence Aerobics is solid, its lexical engine was the weakest of the applications I tested in this category: One time, it mistook a noun for a verb, and on occasion it incorrectly parsed my sentences. 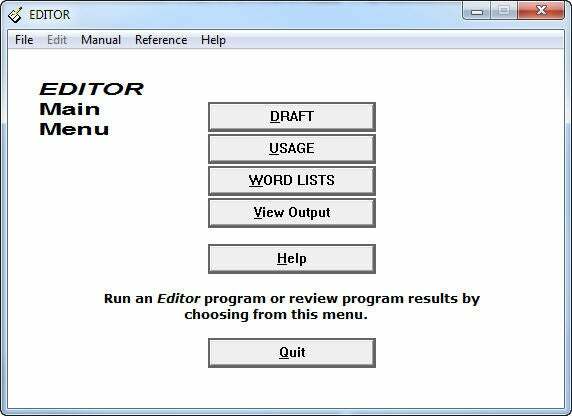 Two other applications--Serenity Software Editor and StyleWriter Professional--play well with Word, but aren't built into it. Serenity Software Editor features excellent usage advice, along with a collection of tests that you can run on your writing for specific purposes ("Tighten," "Polish," and so on). It has basic Word integration (full disclosure: I helped with some of the Word integration code, years ago, on a volunteer basis), but its interface is not very intuitive. Still, for the level of detailed advice it provides, it is priced very competitively: For $75 you get both the core application and a Word add-in. It is the best writing helper I've evaluated in the sub-$100 range. The other "serious" option, StyleWriter Professional, costs $190 and comes with an add-in toolbar for Word, which lets you launch it for processing the current document. It pops up in a separate window containing your text, offering some usage advice and interesting statistics such as the sentence length and the "bog index" (a proprietary metric showing whether your text is difficult to read). StyleWriter's usage advice is excellent, and it lets you add exceptions for rules you don't want to see over and over again. For instance, I don't confuse lets and let's, so I've told StyleWriter to stop asking me about those terms. The main problem with StyleWriter is that you can't change your text in the StyleWriter window, so you must constantly switch back and forth between Word and StyleWriter to make revisions. Despite that issue, StyleWriter is my favorite of all four writing assistants I've evaluated, and I will keep using it even after this review (something I rarely do). Clear, eloquent writing is always important, but when you're creating a long-form work, it's only one part of the picture. What if you need to submit a compelling 25-page business plan to secure a loan, or if you need to compose an intriguing white paper explaining your company's technology? In those cases, you may want to use a dedicated application for outlining your document, writing it piece by piece, and shuffling its parts around. These programs won't help you with wording, but they are invaluable for deciding what to write, as well as for determining how to arrange your material. One application I tried in this category, the $100 Business Plan Pro, guides you through the creation of an impressive business plan, even if it's your first one, and even if you don't know much about business. Filled with text explanations and short videos, it manages to be both comprehensive and inviting at the same time. Although it doesn't check your grammar, it does include tools that check the numbers you present in your business plan, to make sure they add up. Whether you're writing a business plan for external investors or for internal use, Business Plan Pro is a fantastic choice. For other kinds of long-form documents, turn to the excellent Scrivener ($40). This program began life as a Mac application, and the Windows version is still lagging behind its Mac counterpart in functionality and version numbers. Even so, the Windows version is feature-rich and useful. Although its creators market it as an application for novelists and scriptwriters, it includes features for planning and restructuring documents, which any long-form writer could use. 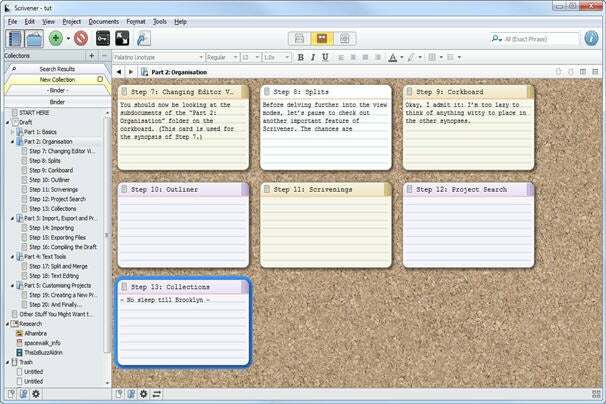 Scrivener lets you organize your research materials right within the project, and it helps you work on separate pieces of your text without being overwhelmed by the project's overall size. Finally, we're back to free applications: If Scrivener's price tag is too high for your project, try the capable WriteMonkey. This full-screen text editor includes a project manager that allows you to compose a long-form work in separate files, track each file's status, restructure your work as you go, and more.